QR codes have been getting a lot of flak lately. Frankly, we at AzonMobile do not understand where the hate is coming from. Some of the things being said about QR codes are simply not true. While other stuff are not completely accurate. 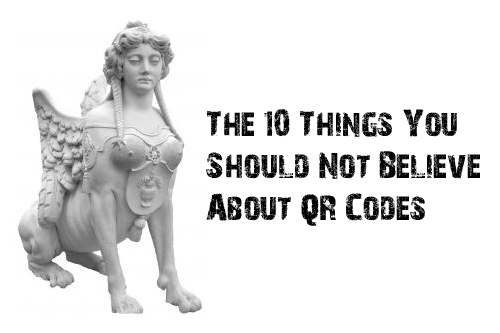 So what are the ten things you should not believe about QR codes? 1. People are largely ignoring QR codes and do not scan them. This is about the biggest myth that we continuously encounter. As to how people could say that no one is scanning QR codes is beyond us. A lot of studies have shown that more than 2.75 million Americans scan QR codes regularly. Not only are people scanning QR codes, but also the number of those who do are increasing. Check out our earlier blog post on QR code scanning statistics here. 2. QR codes are going to be eclipsed by newer technologies. How many times have we seen articles about ScanTags, Microsoft Tags, near-field communication and other similar technologies wherein the writer would say that these are superior to QR codes, and QR codes will soon become obsolete because of them? It did not happen. In fact, QR codes are still more widely used than any of these tags and 2D barcodes. It took QR codes a couple of years to become ubiquitous and recognizable in the United States, so we are expecting any new technology to go through that period as well. The closest contender to QR code technology is NFC. But it is not even a contest. You are certainly not forced to choose one over the other and in fact, it is best practice to use both NFC and QR code to corner a bigger share of your market. These are just two of the myths that we plan to bust in this series. Stay tuned for more QR code myths that you should never believe.